Chatting to a client yesterday afternoon on the topic of resistance and what hadn’t been done and why not, after our exploration I was able to offer a couple of tips. The first I attribute to Michael Neill as that’s where I think I learned it first. It’s about the next step. If you know what the next steps is but you have not taken it, then that’s not the next step. Think of a small child. They can manage little steps quite easily but they need a hand with the big steep ones. Break your next big step down into little ones and you will find your next step. Now that you know what it is, take it. Even more powerful a question according to my client was one I learned from John-Paul Flintoff on Monday night at Alternatives. What are you not ready to do? With this question I recommend sitting quietly for a few moments and asking yourself that. “What am I not ready to do?” Allow space for the answers to come and prepare to be amazed. Some are things which you are simply not ready to do yet. Others are things you didn’t even know you were contemplating doing (or not doing). Once you have given a name to the things you are not ready to do, you can begin to explore why not and what would be the next step to prepare you for readiness assuming you want or need to get them done. As I am writing up these thoughts and questions, I am reminded of one of the books I am reading right now. 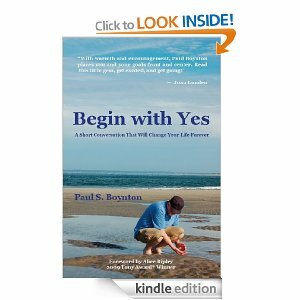 It’s called Begin With Yes by Paul S. Boynton. It is one step beyond the Law of Attraction since it is about how to get into action as are the two ideas above really. What I really liked about the Begin With Yes book is that saying Yes to things and getting engaged and excited and in action is wonderful and compelling, obviously… but perhaps the best thought which came out of reading the book was one of Boynton’s correspondents who pointed out that Yes is a powerful word but perhaps the best word in the concept of the book – and its title – is Begin.